Whilst doing a PhD occupies an almost definite and unrelenting full-time amount of headspace, it doesn’t necessarily have to take up the physical hours of a full-time job. Many people do their PhDs part-time and work alongside, or some people get jobs during the writing up and corrections stage when typically all the funding runs out and you have to resort to eating beans from a can for every meal. Having done the full-time PhD thing, the working-full-time-whilst-failing-to-do-corrections thing, and now the kind-of-part-time-working-on-thesis-but-also-sort-of-working thing, I can say that there are definitely some pros and cons to each approach, and each can mess up your head in a variety of ways. TL;DR: PhDs are hard no matter how you do them. You can concentrate on the same topic every day, hopefully a topic you love. Immersing yourself in academia full time is a great way of figuring out if it is the career for you. Often (in the UK), you get some ££. Not a lot of £. But some. Enough to afford AT LEAST 2 cans of beans per day, provided you don’t mind part damaged cans. Such luxury. It’s over and done with much more quickly (in theory). PhDs aren’t always funded, and so may well require monetary input from you. Bye bye ££, research is expensive. If you decide academia isn’t quite right for you, you’re either stuck doing it 24/7 until the PhD is done, or you leave your PhD to move on with other things. Both options are perfectly acceptable and depend on motivation for the PhD, life circumstances, finances, how close you are to finishing, and a multitude of other things, but neither are ideal. Seething jealousy of anyone with a ‘normal’ job with ‘normal’ hours and ‘weekends’. This can be overcome by adhering to strict working hours yourself, but can be very hard to stick to when lab and office mates are working all hours of the day. If you suffered with the above seething jealousy and wanted a job outside the madness of academia, the initial transition into full-time work is bliss. You get evenings OFF?! What madness is this! And TWO DAYS at the weekend to NOT WORK? With thesis corrections hanging over you though, that initial excitement soon gives way to extreme guilt, probably to a lesser or greater extent depending on how lengthy your amends are. MONEY (highly variable amounts of money but after a PhD some coins and a battered £5 note looks like a fortune). A full-time job might mean that you can now afford almost all the beans you could possibly ever eat. Even a low paying job pays enough to maybe even buy some of the branded tins of fancy beans. A PENSION. In theory you can start paying in to a private pension anytime you like but one thing private pension providers insist on is that you pay with money. As I may have already mentioned, PhDs don’t really equal money. Just sometimes, it would be amazing to work from home in your pyjamas like you did when you were writing up, sometimes not showering for days and snacking on the toast crumbs dusting your jumper from breakfast 2 days ago. THE GUILT. You’re not used to having time off. You still have those amends to do, remember. How dare you pop for a quick pint after work, you should be working on your thesis. Actually fitting the corrections in, if they’re extensive. And it can be tricky switching from ‘job headspace’ to ‘thesis headspace’, which certainly doesn’t aid productivity. If circumstances allow, you can be a bit picky about the nature of the paid work, and choose stuff that will be great for your future career. 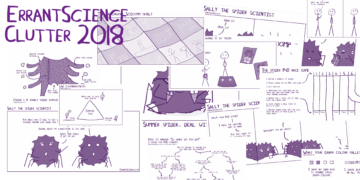 Building up experience, being paid some money, and getting your PhD finished – win-win! Being able to vary your working week, keeping your mind fresh and not getting bogged down in your research. Sometimes putting your brain to work doing something unrelated can lead to big PhD breakthroughs! Some money coming in, even a little, really helps the bean purchasing. You might have to bulk buy but on days when you’re at home you’ll almost always be able to enjoy beans AND some toast. The initial job-hunting for part-time/casual work. Ugh. Especially when explaining to future employers why you only want part-time work (see next point). The time balance of work to thesis can be tricky, and is often largely dictated by finances. Every hour you spend working is another hour not spent on thesis, thus dragging it out even further. Having to go to work the day after you’ve had a breakthrough on your thesis, when you really just want to stay up all night and tick that mammoth task off your to-do list. 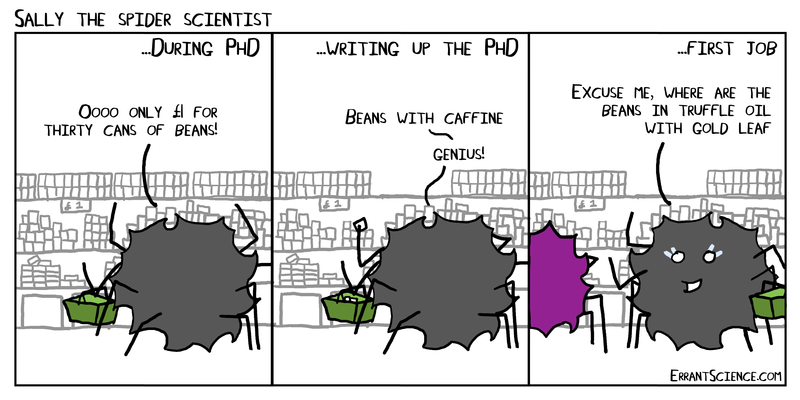 So there really is no easy way to get a PhD. Regardless, the way is paved with guilt for not working on your thesis vs. the need to eat something else other than beans. Of course, if you love research and manage to get a postdoc, this route is filled with a whole other heap of pros and cons. 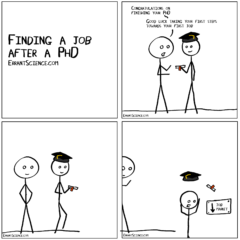 And if you manage to get your PhD done and dusted with minimal amends so you can easily and quickly move onto the next stage of your career, then awesome! But for many of us, the above situations are real, and the benefits and disadvantages of each are worth considering. And let’s face it, when it comes down to it those pros and cons are mostly to do with the amount of beans you can afford to consume, which is clearly the best job comparison system.